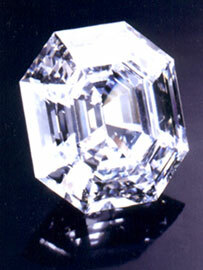 The Star of America is the largest Asscher cut D-color Flawless diamond in the world. The Portuguese Diamond, also an Asscher cut, is larger at 127 carats, but it is somewhat yellowish in color. It was discovered near the Orange River, originally a rough stone of 225 carats. After nine months of cutting and polishing by the Graff company's craftsmen, into the 100.57-carat stone you see here, to commemorate the launch of Graff USA. The Star of America, on the right, and the La Favorite, on the left, weighing 100 and 50 carats, respectively. 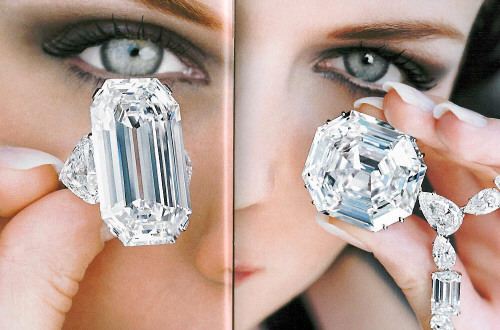 Both diamonds are D-color and both owned by Laurence Graff.